Review Summary: For curious Shreya this will turn out to be an unforgettable summer holiday. Her adventures land her in forbidden territory of a village where a dark secret awaits her. For curious Shreya this will turn out to be an unforgettable summer holiday. Her adventures land her in forbidden territory of a village where a dark secret awaits her. Bollywood has a new Khan! "Jalpari" should immediately be granted tax exemption and made accessible to every Indian who loves his daughter and to every womb breaker who ever thought of snuffing an unborn life out. 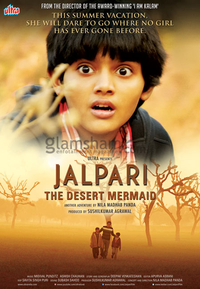 Jalpari doesn't quite match up the brilliance of I Am Kalam but still remains an endearing watch. Released on 31-8-’12 at Inox (daily 1 show), Sterling (daily 1 show) and other cinemas of Bombay by Ultra Dis- tributors thru Multimedia Combines. Publicity: so-so. Opening: dull. …….Also released in Delhi-U.P. and East Punjab.